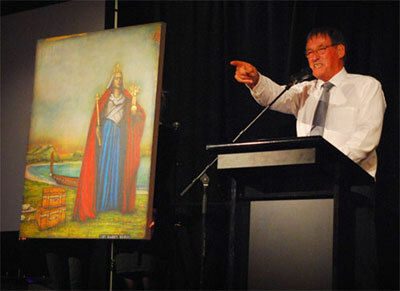 Organisers of the inaugural Pat Farry Trust Wine & Art Auction and Gala Dinner held on Saturday, 10 March 2012 thanked Dr Pat Farry’s peers and local community for a highly successful fundraiser. The Pat Farry Rural Health Education Trust in conjunction with the New Zealand Rural General Practice Network hosted the Trust’s first fundraiser. The event began with a seated dinner of local wine and cuisine and a performance from Sam Hunt, poet and balladeer. More than two hundred guests took part in the auction of 33 lots of amazing art works from Otago/Southland artists and ‘best of’ collections of Central Otago wines, winemakers tastings and tours. More than $36,000 was raised and will go directly towards the Pat Farry Rural Health Education Trust’s roster of scholarships. The event was generously supported by the Closeburn Directors, the New Zealand Royal College of General Practitioners, Rural Women Glenorchy and local businesses ASB, Goldridge Resort, Anderson Lloyd, Mountain Scene and Millennium Hotel. Many of those in attendance were in Queenstown for the annual New Zealand Rural General Practice Network conference and had been up early to participate in the inaugural Pat Farry Trust Fun Run Walk.